next week with more stories from the trail! If you want to be here, next year, the most important step is to make the commitment. Another hiking season is drawing to a close. It’s not impossible to hike the John Muir Trail in late September or early October, but if you do, you need to be ready (both in terms of gear and skill) for snow. Possibly, lots of snow. 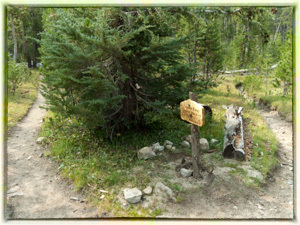 With the season nearly over, what should you be thinking about if you intend to hike the JMT next year? First, you can make reservations at Curry Village, The Yosemite Lodge, the Tuolumne Lodge, or (if your tastes run to the more comfortable) the Ahwahnee Hotel, one year and one day in advance. That means you are already well within the window for a hike beginning in July, August or September of next year. Six months before you arrive at the trailhead you should have decided the dates of your hike, which way you are going to walk (southbound or northbound), how much time (and where) you are going to take to acclimate to the higher elevation, how you are going to get to and from the trailheads, an idea of what gear you will need, and how you will train your body to be ready. Wilderness permits (which are mandatory) can be secured 168 days in advance. That means, for an early July start, you need to request your permit not long after the first of the year. More important than all of this, however, is what’s going on between your ears. A thru-hike of the John Muir Trail (and the preparations for it) will tax your mental toughness as much as your physical conditioning. I’ve met slow and fast hikers of the John Muir Trail. I’ve seen slim and not-so-slim ones, young and old, experienced and first-time backpackers. The one common denominator in all the SUCCESSFUL thru-hikers is this: determination. It’s never too early to make the commitment. I met you on the trail – we hiked part of Lyell Canyon together. Thanks so much for calling my mom – she was most appreciative to hear I was fine. I had an amazing trip – 14.5 days. Really wished I had more time – that is not landscape that should be rushed through. Hope you had a great trip. Again, thanks for calling my mom. I am so pleased that your hike went well. I hit the summit of Mount Whitney on the 12th, pretty much as planned. My wife, Kathleen, actually left a message on your Mom’s voicemail. Glad to hear she got it! It was a pleasure meeting you on the trail (from Reds to MTR). With the second night at the ranch, you missed the storm? I did Whitney on the 11th, just one day before you. Making good friends on the trail was key for keeping it all in perspective. Great to meet you as well, Steve. Yes, I was tucked into the lounge at Muir Trail Ranch on the day it rained for several hours. With just a few days to go, I was feeling pretty smug about that. Then, on the 10th I found myself on the Bighorn Plateau in the middle of a thunderstorm, and on the 11th it rained and hailed at Guitar Lake. The trail to the summit also had about half-an-inch of snow. Oh well, all’s well, etc., etc. Keep hiking!